This year we are thankful for the abundant rain that helped to plump up our apples. However, the past 3 seasons of drought has taken its toll. The trees uptake nutrients through their roots in August/September for the following year. Without rain, the nutrients are unavailable. We have seen significant leaf loss and other signs of stress. But the show must go on, so we are celebrating our apples for what they are…. super healthy and amazingly flavorful with CidahFest! Please join us from 2:00 – 5:00 pm on Saturday, October 20th as we welcome the musical talents of Jason Roman with some comfort food and drink (hot cider, of course!) Take home gallons of our craft raw cider will be available as well. Parking is limited, car pooling is recommended. Also, you can find us at Frinklepod Farm (244 Log Cabin Rd, Arundel) on Saturday, October 13th from 10:30 – 2:00 with our Pop-Up Cider Shop for another opportunity to taste our cider and take some home. 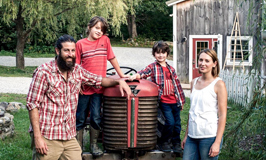 ***Unpasteurized raw cider can only be sold by the farmer. Due to FDA regulations, it is not available in stores. WARNING: Once you taste the difference, it may ruin all other ciders. We made the decision that the current apples are not salable. 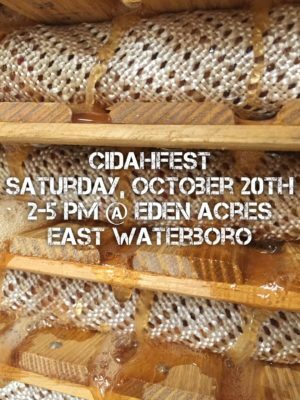 We will be concentrating our efforts on cider and the process of making apple cider vinegar. CIDER AVAILABLE: Half gallons, flash frozen right after pressing, are available by appointment. 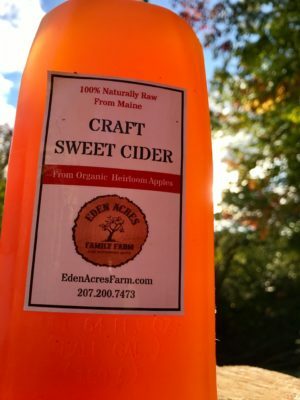 Simply call or message Ali at 808-0760 to make arrangements to get your hands on some of our most amazing craft sweet cider. Never pasteurized or UV treated. NOTE: As stewards of a carefully balanced ecosystem, we do not offer Pick-Your-Own. 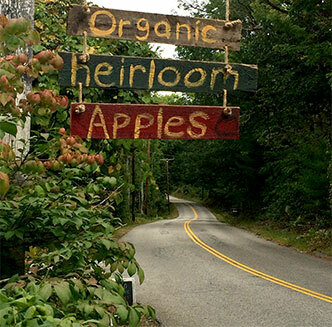 We offer a tasting experience featuring 30+ varieties of organic heirloom apples!